I’ll be speaking in Florida from March 7th through March 21st. Take a look at my schedule and see if our paths can cross. If not you, maybe a digitally-challenged friend or family member could benefit by attending. A TV interview with Channel 8 Tampa. 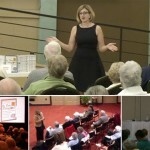 10 Tips for Teaching Silver Surfers – Osher Lifelong Learner Institute, University of South Florida, Room NEC 300, NW corner of USF campus (Fletcher/Bruce B Downs Blvd), Tampa, FL. Make Every Click Count – Senior Networking User’s Group North Tampa, University of South Florida, Room NEC 300, NW corner of USF campus (Fletcher/Bruce B Downs Blvd), Tampa, FL. Safely Surf the Internet and Find (Almost) Anything Online – Port Saint Lucie Cascades Computer Club, 800 The Cascades at St Lucie, FL. Navigating the Digital World – Cascade Lakes Computer & Technology Club, 5075 Cascade Lakes Blvd., Boynton Beach, FL. I purchased your book and 2 others ( Windows 10 for Seniors and Computers for Seniors) , through Amazon, which has prompted me to say that for me personally, your book is proving to be far more useful and enjoyable than the other two, which I read first. I almost gave up, but you have well and truly motivated me very quickly, so thank you very much. I’m so glad that “Is This Thing On?” has proven helpful. Thanks so much for letting me know!